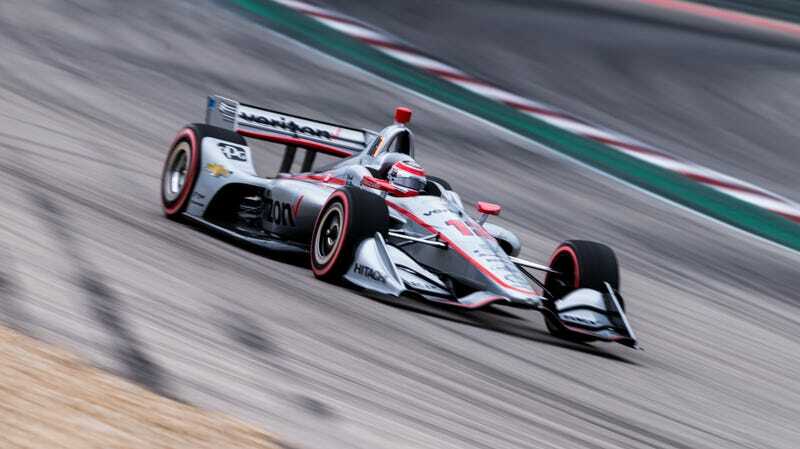 It’s the IndyCar Series’ first time at Circuit of The Americas in Austin, meaning basically everything is a record—lap times, session results and the like. And, with Saturday’s qualifying wrapped up, the first ever pole sitter for an IndyCar race at Circuit of The Americas is 2014 series champion Will Power. Power, who made it into the final round of qualifying ranked fifth out of six drivers on an overcast day at the 3.4-mile Texas road course we’re all used to watching Formula One on, will start Sunday’s IndyCar Classic ahead of fellow Fast Six qualifiers Alexander Rossi, Ryan Hunter-Reay, Colton Herta, Felix Rosenqvist and five-time series champion Scott Dixon. The rest of the starting lineup is here. This makes Power’s second pole in the series’ second race of the year, giving him a perfect qualifying record so far in 2019. It’s also his 56th career pole and moves him closer to the Indy car record of 67, held by Mario Andretti. Several drivers swapped out the pole spot during the round of six on Saturday afternoon, with Power taking the pole from Rossi at the end of the session and with the top five all separated by about half of a second. But everyone in the top six got a benefit that the rest of the field didn’t, pole position or not: an extra eight minutes of green-flag time on track in the final round, up from the series’ usual Fast Six allowance of six. That’s a huge benefit, considering that other than testing, IndyCar is brand new to Circuit of The Americas and given that the series isn’t enforcing track limits in the 19th turn. (That’s been wild, so far.) COTA, which has Lewis Hamilton’s personal playground since it joined the F1 schedule in 2012, brought on IndyCar for 2019 despite Texas Motor Speedway’s touchy politics around regionally sharing the various racing series it has contracts with. But IndyCar is in Austin now, no matter, and Power will see COTA’s mountain of a first turn from the best view the track has—in front of the field. Whether he’ll stay there and add to his list of firsts this weekend, we’ll all just have to see.